I have just received my Archery Tag® order and, I would like to sincerely thank you for the quality of the service and your professionalism. The material is very good and it is already good feeling with my users. Really, thank you ! I do not regret having trusted you, and next time I would take an order, I will do it with my eyes closed. The Archery Tag mask address all those safety and cleanliness issues for us. From the first time I saw them with their mesh goggle instead of an acrylic lens, I could instantly tell that these were going to be a game changer for us. The mesh does more than just remove the fogging issue, it changes the game environment because it breathes so much better, this makes for a much more pleasant game experience and keeps the participant sweating to a minimum. The one-piece design is a huge help in the cleaning process, we literally just wipe them down with cleaning wipes. The adjustable Velcro strap is so intuitive for our customers that we no longer even need to even explain how to tighten them. Due to the super lightweight of the mask, customers and staff comment regularly on how much more comfortable they are to wear. At first, I admit, I was slightly concerned with how well they were going to hold up to extensive use do to the extreme lightweight and being constructed almost entirely out of foam. I was concerned specifically about area where the strap goes into the mask, it seemed a little “thin”. However, after almost a year, 60,000 people or so, with not one single issue with any of our 100 masks, I can honestly say that I am astounded at the quality and durability of the product. It is a true game changer! The Real Tree Archers is a Virginia chapter of Christian Bowhunters of America, and we decided that the Hoverball would be a wonderful way to introduce people, but especially youths, to archery and to our Lord and Savior Jesus Christ. Well, 2018 was a breakout year for us with the target. We had more requests for the target to be set up, especially at vacation bible schools, and with the use of a portable generator, we were able to set it up at a local fair and 2 street events as well. I have attached a PowerPoint presentation of how the Hoverball impacted our ministry but I also wanted to share a quick story. At one of the street festivals, we had kids shooting for quite awhile, and most all left with smiles on their face. They usually can not walk by it without wanting to know what it was and if they can try it. Well, one young man came up and was able to hit one of the balls. As usual we try to be very enthusiastic in commending them when they are successful. Well, this little boy really surprised me when he was done, he actually hugged me. I can not express how much it caught me off guard. But it made me realize that maybe something like this will get them off the couch, phones, etc. and get out try this. It has also caused me to research more for opportunities, as once they shoot, the next question, especially from parents, is how they can get involved with archery. So, we now try to direct them to NASP, local 4H archery, Centershot, and I even found great information on college opportunities. It has been a win win proposition. My next step is in trying to introduce it more to the local schools and especially impress upon their guidance counselors the potential college scholarship opportunities. I can not thank you all enough for your kind support to our ministry, but I can safely say that this target has allowed me to see God's blessings. UPS held our quarterly meeting at Global Archery’s facility in Ashley Indiana. Global Archery went above and beyond our expectations for the facility. From the meeting room setup, complete with video screen, to the provided refreshments, everything was top notch. We had catered in our own lunch, but Global Archery had everything else we needed. They provided a refrigerator for our use, along with power strips along their “snack bar” area. Global Archery had the entire facility decorated for the holidays just for our event. We could not have picked a better place for our meeting. But of course the real reason we were there was to play Archery Tag. The staff had set up some targets before so my team was able to get hands on training or practice with their equipment. Everyone was very helpful to those who needed extra direction, or encourage those who were experienced archers. As a group of competitive adults, we had a blast. Everyone wanting to go back again for the next meeting. On a 5 star scale, I give the meeting and play area at Global Archery 5 GOLD stars. The equipment is great; we have had no issues since receiving March 2017. I greatly appreciate the customer service and honesty of the company. All of the customer service reps have responded quickly and answered all questions. When I was in the process of purchasing the equipment over the summer, Shawn was very responsive to my needs and very accessible. Your business excels in its customer service. Thank you to you and your time for your help along the way making it happen and keeping an eye on things along the way. Customer service is king!! Keep it up!! Just wanted to follow up with you regarding my recent experiences playing Archery Tag with you in Ashley, IN. The first time, two weeks ago, we played as part of my brother’s bachelor party and had an absolute blast! None of us had played prior to that, and thus, did not know what to expect, but ALL of us left with smiles on our faces after having a great time blasting arrows at each other. These games got INTENSE, and it was fun having you and Kyle join in for the fun. Because I had so much fun playing the first time, I decided to schedule a second outing to the Ashley facility with 8 of my really good high school and college friends (we were up at Hamilton Lake for the weekend). This time I knew what we were in for, but was really excited to show the game to the others. Again, we all had a blast playing elimination, “zombies,” and V.I.P. / Defend the President. I recommend making the “Defend the President” game a game mode that you play with other groups - that was fun! Thank you very much for taking time out of two of your Saturday’s to host us at your HQ facility, and happy belated birthday! We were looking for a new activity to add some additional excitement to our menu of programs, and Archery Tag has done that and more. Our students here at the University of West Florida have taken to the sport well and continued to ask for more. Additionally, all of our event participants have expressed their enjoyment of Archery Tag, and we have already started seeing referrals for more events. When we initially requested a quote and placed an order for purchase, everything was quite easy. Your sales representatives were very helpful and made it easy to adjust our order to meet our needs. My name is Tom D'Ulisse and I'm a teacher at Kina Awiiya (Formerly named Urban Aboriginal High School). Unfortunately, as often happens in the world of teaching, my time here has come to an end and another teacher will be taking over my duties. I wanted to say thank you to Archery tag, especially to those who have personally dealt with me as I went through the application process and had the pleasure of using Archery Tag with my students. Your product has brought our students together, introduced them to the idea that being active can also be fun. It has allowed me to provide my students with a unique opportunity to run a program for other beginners in our school board, helping them develop leadership qualities and patience and to develop a level of respect for each other and for the sport of archery. I want you to know that wherever I go to teach next, IF I'm lucky enough to teach physical education or outdoor education I will do my best to pursue funding, and use my budget to attempt to bring Archery Tag with me to my next site. It has been a wild and amazingly fun ride, I've had nothing but positive experiences working with the wonderful people at Archery Tag, and I can honestly say that my class dynamics changed for the better the minute we started to incorporate the sport in my class. It has built friendships, mended relationships, allowed for many teachable moments and has brought fun into a class where so many of the students haven't been able to smile let alone have fun for personal/family/substance abuse/ addictions/ mental health reasons. Thank you again, from the bottom of my heart for allowing me to run this program in my school as a not for profit package privately with my school and it's student's. You have an amazing product and I hope to work with it and you all again in the future. "Don't buy crap equipment to save $500. Buy something that has never caused an injury and had thought and an engineer behind it. You will be much happier knowing the people playing your game are safe while using equipment that doesn't fail after one day of use. The first time some kid gets a puncture wound from a garbage arrow tip, your business will no longer be a destination for any parent. Don't be the person that ends the fun for the rest of us. I know that Archery Tag® does research, they have engineers design their stuff, and it is safe for use because I have played using their equipment. I won't buy anything but official Archery Tag® equipment now." 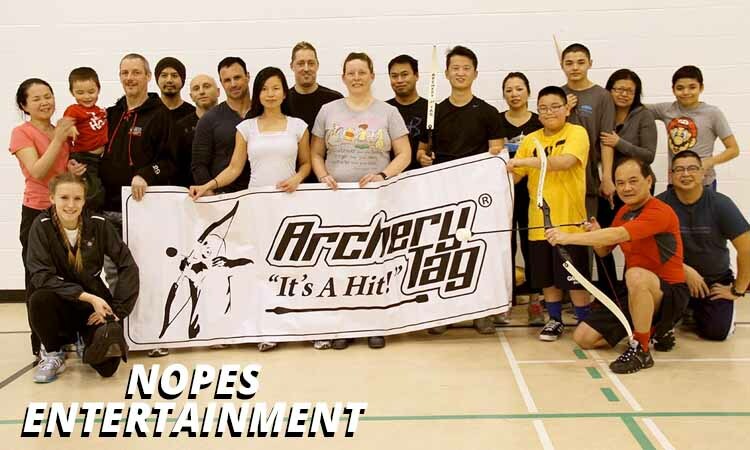 "Anyone who might be thinking about adding Archery Tag® as part of their gaming venue: DO IT! My experience with Archery Tag® from my request to become a license to now almost a year has been nothing but great. The owner John Jackson is by far the coolest and most down to earth guy that truly stands behind his products and his customers. I would have never thought I¹d get a call from him first when I initially filed the application. It was great to speak to him and he actually listened and made suggestions on ways to get the word out that I never thought about before. Now almost a year in and we can proudly say we got our ROI real fast. So for those who are trying to increase revenue, adding Archery Tag® is definitely a sure win." "I was the biggest skeptic out there..."
"It's been 100% safe, we’ve had no issues whatsoever." "Proven record. You know, the arrows have proven to be perfectly safe... and the mask systems, no concern at all." Watch the interview by clicking on the video. "First of all, thank you! We have been really happy with the product. It fits us PERFECTLY and our consepts surprised even us! They are working better than we ever even imagined!! In the coldness we have to keep the players on move all the time (keep them warm) and mixing the archeries with our laser tags needed some new ideas, so i made this kind of a Feeze&Melt strategy. Main idea is that when the Archery player hit an enemy, he/she will have to freeze. Only your own team member can shoot/melt you back to the game. With this we have created many different games and got only 100% amazing feedback! 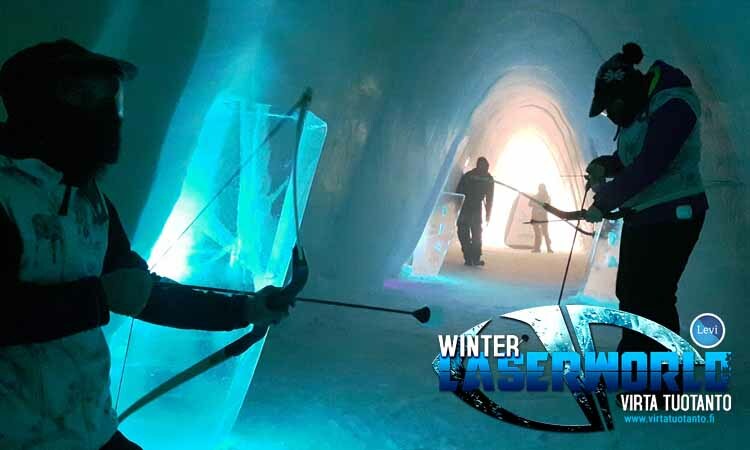 We have already played many times, done many marketing events by tarketing shooting, created new event - Snow Battle in the snow castle Snow Village and we are opening for the summer the games for Archery Tag and Arctic Hunger Games on a daily base to Helsinki´s Winter Hall (-3 degrees whole year around, snow igloos, ice bar, ice restaurant, ice sculptures, etc..)"
"...we [obtained] a few archery products in the market, including a couple of local products in China. After some stress tests to arrow, bow and mask of many vendors, we concluded that Archery Tags®' products were unparalleled in terms of quality and safety." "Archery Tag® has continually listened to customer feedback and pushed yourselves to develop the best foam tip on the market." 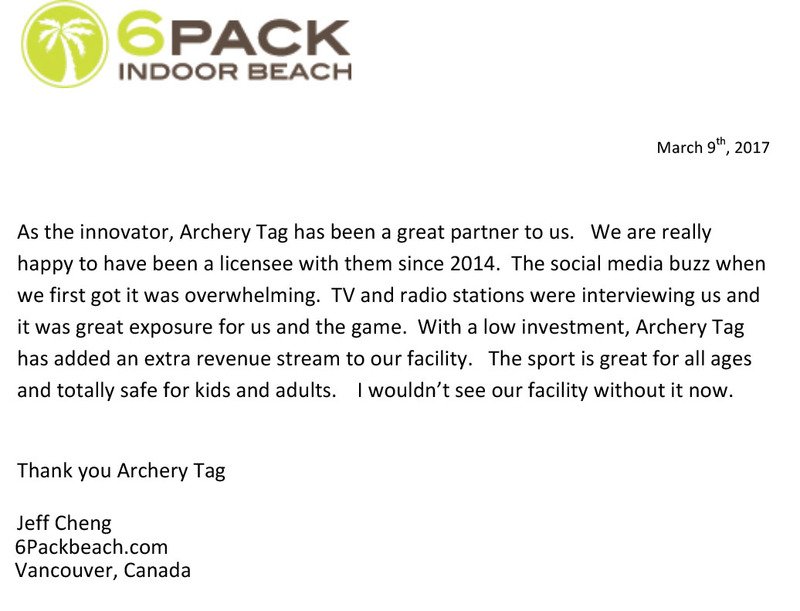 "As the innovator, Archery Tag® has been a great partner to us. We are really happy to have been a licensee with them since 2014. The social media buzz when we first got it was overwhelming. TV and radio stations were interviewing us and it was great exposure for us and the game. With a low investment, Archery Tag® has added an extra revenue stream to our facility. The sport is great for all ages and totally safe for kids and adults. I wouldn't see our facility without it now." "From a business perspective, it's great to have been able to bring something truly exceptional and unique to the Middle East. 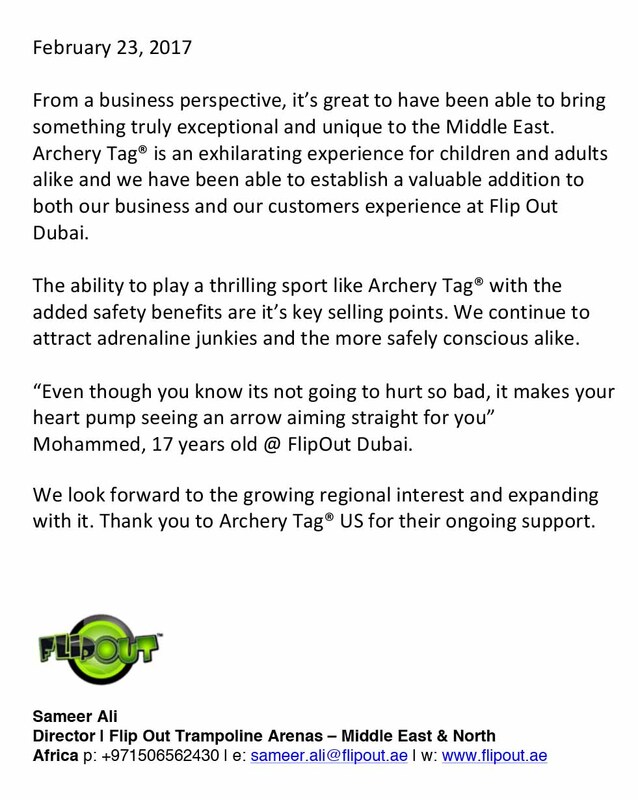 Archery Tag® is an exhilarating experience for children and adults alike and we have been able to establish a valuable additional to both our business and our customers experience at Flip Out Dubai." 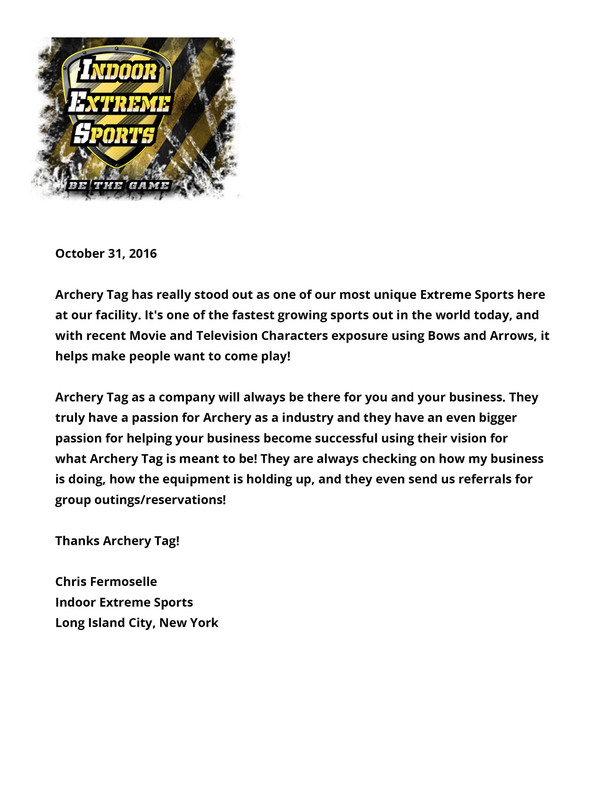 "Archery Tag® as a company will always be there for you and your business." "Archery Tag® is an absolutely new way of having fun in Latvia! While we do have a lot of well-known role-play games that require shooting, bringing bows and arrows to our country is something people have never seen before. Which is why our customers were pleasantly surprised of how safe and fun archery can be! After their very first time of playing the Archery Tag® game, we met them again and again with their kids and colleagues. Hence, our customer network is growing which indeed is highly motivating! 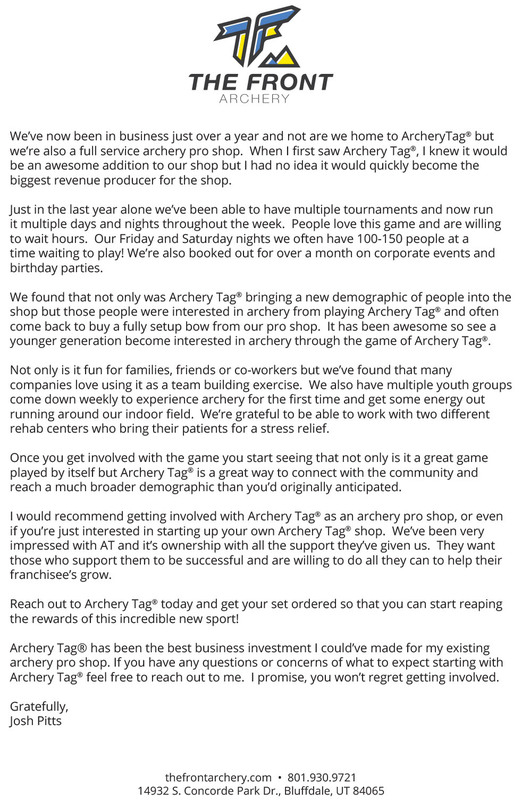 Thank you Archery Tag® team for providing this opportunity for our family business establishment! " Thank you again for taking the time out of your busy day to talk with me. It was great hearing about your many ideas and I was thrilled to learn that you're always pondering new ways to better the product. Sharing your thoughts and basically your heart, helped to humanize the Archery Tag® product. By learning more about the insight to the vision for your company, I as a licensee am comforted to know that you have our best interest at heart and we are part of the bigger picture. I'm not sure if you do this enough by listening to you, but please remember to take the time to pause and just enjoy this path that you've led us on. This venture of constant innovation that you're on will never have a final destination, so it's important to periodically celebrate the journey." "We found that not only was Archery Tag® bringing a new demographic of people into the shop but those people were interested in archery from playing Archery Tag® and often come back to buy a fully setup bow from our pro shop. It has been awesome so see a younger generation become interested in archery through the game of Archery Tag®."